Bibliophiles of Tulare County owe Sandy Parmelly a deep debt of gratitude. 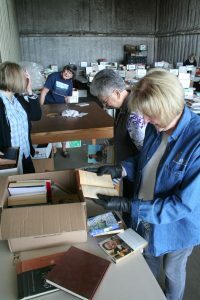 When the American Association of University Women’s Semi-Annual Book Sale begins April 18 at the Sequoia Mall in Visalia, it will mark the 14th year Parmelly has overseen sorting of the tens of thousands of books collected, boxed, stacked, sorted then sold at rock-bottom prices to an eager reading public. The sale runs through April 23. Price tags top out at $3. “If Sandy quits on us, we’re done!” said Jan Johnson, who shares the Book Sale chair duties with Parmelly. Parmelly plays down the importance of her role a bit. “I’m stuck in Visalia a couple of times a week, so I got the honor of holding onto the key to the storage,” she said. Johnson, who oversees the business end of the Book Sale, sees more in Parmelly’s volunteers, who gather once each week to cull the literary runts, then group them by genre in a disused citrus cold storage on a dusty side road in Exeter. “The ladies are so faithful,” Johnson said. 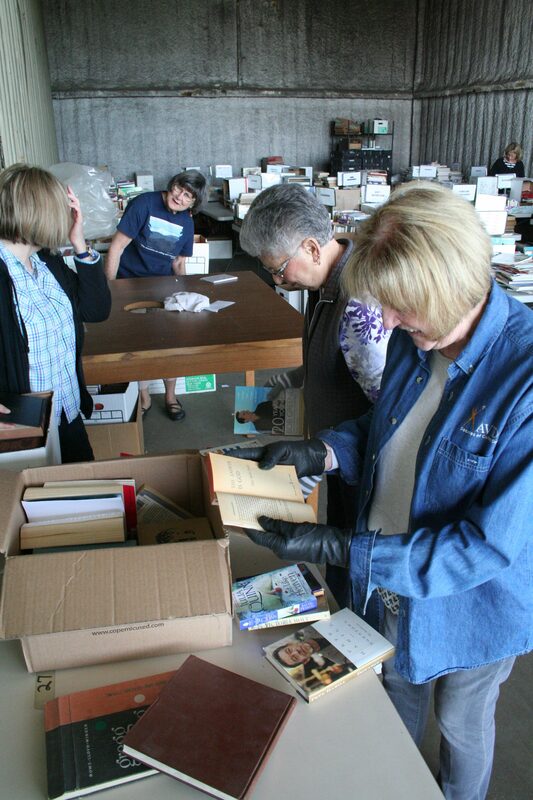 The sorting space–donated for AAUW’s use by Sequoia Orange Packing–will be extra busy in the run-up to the sale, and early buyers will enjoy a wider range of titles. Members of the Sequoia-Visalia AAUW have sold used books since some time in 1965–or perhaps 1966, as history does not record an exact date beyond the fiscal year–then used the proceeds to fund higher education for local students. AAUW scholarships to COS students seeking to further their schooling are available to both women and men. Men are also welcome to join AAUW, provided they are college graduates. Part of the proceeds from the book sales, Johnson explained, also help fund Tech Trek, a week-long seminar for middle-school girls held on-campus at Cal State Fresno. Topics for the gathering center on science, technology, engineering and mathematics, with a goal of increasing female participation in those fields of study and work. Providing educational opportunities to local students is far from the extent of AAUW’s work in and around Visalia, though it is where the good works of the members began. The club started in 1926, and by 1927 it had established a loan fund for college-bound locals. It was a decade later, in 1937, the AAUW hosted the first in a long-running series of community forums, and when WWII broke out the AAUW sponsored Hospitality House for area servicemen. 1949 saw the first scholarship for a College of Sequoias student moving on to a four-year university, and in 1950 it became an annual program of giving, which now awards dozens of scholarships each year. The Book Sale would become the primary funding source in 1965. Along the way, AAUW members have sponsored art shows that inspired the creation of the Tulare County Art League, sponsored the first four productions of what would become the Visalia Community Players, and lent its efforts to improving Visalia’s street signage, putting PBS on the air, and getting City Hall to hire animal control officers. AAUW is also a regular co-sponsor of candidate forums during local election cycles. The next forum–featuring candidates for the 22nd Congressional District and the 26th State Assembly District–is 6:30pm Monday, April 30 at the Tulare County Office of Education, 6200 S. Mooney Boulevard. “One of our goals is to keep our community informed,” said AAUW co-president Nancy Adalian. The night will include meet-and-greets with candidates for Tulare County District Attorney, Sheriff-Coroner, Assessor-Clerk-Recorder and Auditor-Controller-Treasurer-Tax Collector. Co-sponsors for the night includes the Tulare County League of Women Voters. For more information about the book sales, candidates forums, AAUW’s other activities and joining, visit visaliasequoia-ca.aauw.net.